Episode 3 was called “An Iron Couple.” If semi-sentient androids love each other because of their programming, is that any less “real” than humans loving each other due to instinct and neuro-chemical reactions? Amazon’s selling a CD with the intro theme song. You can buy it here! Detective Raito Shiba would love to investigate a string of bombings targeting Yatsuka Heavy Industries. To his great frustration, though, the Superhuman Bureau keeps pulling rank and taking possession of the evidence. Shiba comes out and says that there are no good superhuman; only monsters. Daishi Akita reveals to the Superhuman Bureau team that Shiba had been killed and a scientist, “for fun,” put his memories into a robot body. As Shiba visits the Yatsuka plant he suspects will be the next target, he meets a young girl. He sees members of the Superhuman Bureau, he grabs her arm, and urges her to run. The shock resulting from his touch surprised both of them. Before he can explore their reaction, she says, “He’s here!” and attacks a truck. In the chaos of the ensuing battle, the young girl robot escapes, and Shiba is injured/damaged. The female robot must really have wanted to get away from Shiba. She was willing to tear off her own arm to do it! Capture from the Funimation stream. The timeline leaps forward to a lone soldier returning from a war he hadn’t known had ended. Shiba, now with blonde hair and introducing himself as a former detective, frees the soldier from the guards who escorted him off the plane. Back in the “present,” Shiba awakes from his injuries in Jirou Hitoyoshi’s house. There, he learns that two androids had been created and programmed to find one another and “merge.” Precisely what that means isn’t clear. The consensus is that they will create a terrifying bomb. Shiba tracks her down and tries to attack her. Hyouma Yoshimura uses his powers to stop time so Hitoyoshi can save her using his Equus transforming car. The battle ends badly for Hitoyoshi. When she learns that Shiba suspects she only wants to merge with the other robot to become a bomb, she jumps into the river and apparently commits suicide. Even though he had called for her destruction, Shiba appears crestfallen. Back in the future, Shiba brings the soldier to the spot where the female android had jumped into the river. He had found the female robot’s body there in the sentiment. The soldier turned out to be the male android. Shiba reveals that in his view, his country has completely lost its way, and he urges the soldier to merge with the female robot so their detonation can shake his country out of its stupor. Hitoyoshi arrives and awakens the robot. Instead of exploding, they merge into a single new superhuman. The merged entity judges Shiba’s action as evil and refuses to obey him. Hitoyoshi explains that the android’s designers had created them to be the embodiment of justice and righteousness beyond a human’s failings. Shiba in robot form. 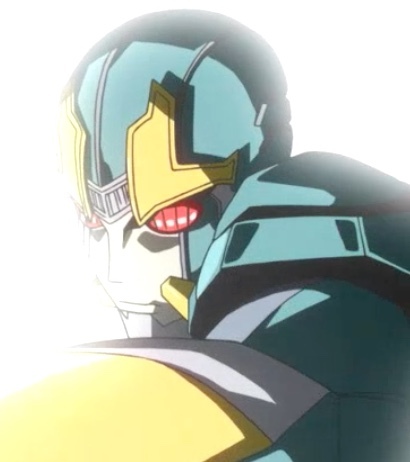 Seems like the majority of characters in this show have a robot form! Capture from the Funimation stream. Shiba, never one to gracefully admit defeat, attempts to destroy the robot. In a lull, Hitoyoshi powers up and so does Shiba. They attack each other and the episode ends. Shiba hates the Superhuman Bureau, so it’s easy to see him as a villain. However, the narrative took the time in this episode to explain his reasons. It showed how his own situation inclines him to hate the Bureau. I like characters with depth. Hitoyoshi was playing the guitar as he waited for Shiba to wake up. That’s a creative side of him that’s completely consistent with his first instinct to try to talk things out (at least in the “present” time line). It makes me more curious than ever to find out what disillusioned him in the future timeline. When the merged android spoke, its voice was a blend of the man and woman androids’ voices. I thought that was a poignant touch. I said it before, and I’ll probably say it again. I love the ending animation and music. 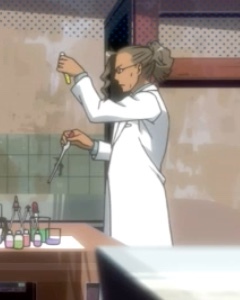 When anime shows scientists at work, why are they always swirling liquids around in test tubes? Shouldn’t they have other experiments to conduct? And why no eye protection? Latex gloves? I think that a show as otherwise creative as this one could find a better way to show a scientist at work. Scientists always seem to be swirling test tubes. Capture from the Funimation stream. I didn’t understand why the androids had to merge. Why couldn’t the scientists who made them make two embodiments of righteousness? I supposed thematically that would not work, but without what I would perceive as a “better” explanation, their search for other, while sentimentally satisfying, was intellectually disappointing. 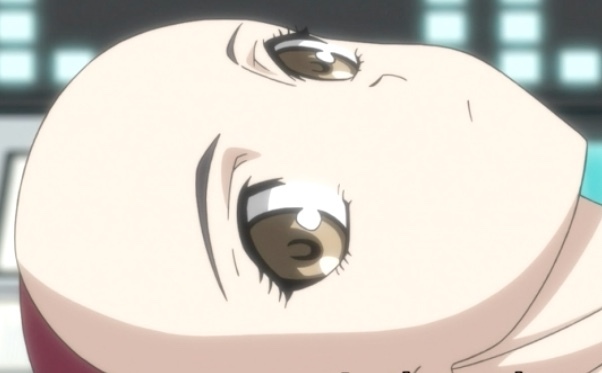 It was gratifying to see Hitoyoshi reattach the female android’s arm near the end of the episode. However, when she lost her arm earlier, she appeared to damage it. In other words, it didn’t look like it would cleanly reattach. Maybe Hitoyoshi or his father fixed it, but that detail still bugged me. The ending left me deflated. Was it intentionally vague? Will it continue next week? After processing present and future timelines for the entire episode, I didn’t have enough mental elasticity to deal with the ending! I think I understand what the writers are trying to do with the split timeline. The question for me still remains: is the effect worth it? I find it sometimes hard to remember the details between the two timelines. I’m still interested! I still really want to know what drove Hitoyoshi to leave the Superhuman Bureau. Is he still with Emi Kino? Is he really the Bureau’s enemy, or is he more of a free agent? In spite of that interest, though, I find myself tired after trying to sort through the implications of both time lines. It’s an old theme, but I enjoy seeing treatments of non-human, non-organic love. Capture from the Funimation stream. Though this series is far from the first show to tackle the issue of non-human love, I welcome attempts to explore that topic. In this case, the show seemed to ask how different programmed android love really was. Humans have instincts; aren’t those analogous to programming in an android? If not, what’s the essential difference, especially if the androids are also given autonomous behavior? Nothing shockingly new, but it still captured my interest. I didn’t like the ending this week. Like I said earlier, following the plot as it jumps forward and backward in time takes some energy. Trying to sort out an ending that might be intentionally vague or might be a cliff-hanger pushed my gnat-like attention span over the edge. That sounds more like a failing in myself than in the plot. I can’t exclude that possibility! But gnat-like or not, the attention span I have is the one I brought to this show. This episode was hard for me to embrace.